Brazzein is a exciting new sweetener, with a number of unique properties. It comes from the Oubli climbing plant which is native to West Africa. It is a protein and is an astonishing 1,000 to 2,000 sweeter than sugar, making it one of the most potent natural sweeteners. It contains 4 calories per gram but is so sweet that any food portion will contain virtually zero calories. It has an excellent taste similar to sugar. In tests it was shown to be superior to other sweeteners, being closer to sugar with little or no metallic or bitter aftertaste. As with all potent sweeteners the onset and duration of the sweetness is somewhat different and longer than sugar. However, like sugar, it does not have a cooling effect and rinses cleanly and quickly from the mouth. It is very heat stable and water soluble and so is suitable for cooking and for processed foods. It is also PH stable. It can be used very successfully to reduce the aftertaste of other sweeteners. It has a synergistic effect if mixed with Stevia. It is not yet available commercially, so we will have to wait and see. 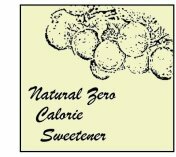 But it is reputed to be the zero calorie sweetener with the taste profile most like sugar. That, and the fact that it is natural, and heat stable, should mean unlimited potential applications. Zero glycemic index. Very sweet. Excellent taste. Not harmful to teeth. Very suitable for diabetics. It is a natural product. Heat stable, acid stable and soluble. Not yet approved so the FDA do not issue an acceptable daily intake recommendation. This is likely because of lack of testing results and approval and because, as a protein, it could possibly cause food allergies. It is produced from the Oubli climbing plant of West Africa. However this is expensive, and at this time uneconomic. Cweet have developed a patented bio-fermentation process which is showing promise. Food Navigator report that developments are taking place to gain approval for Brazzein produced from food grade bacteria. Marketed as Cweet by Natur Research Ingredients Inc, Los Angeles, CA. Not yet available but regulatory approval has been applied for and is expected in the near future. It has been known and used for centuries by natives of Gabon and Cameroon. Appears to work well with Stevia to improve flavour and sweetness. As proteins go it is a small molecule, being composed of a sequence of only 54 amino acids. Awaiting approval in the United States. Not yet approved in the EU. Brazzein is an excellent and natural zero calorie sweetener. No known side effects. Not yet well known but should have a very bright future indeed. Probably superior to Stevia in every way. The biggest problem is commercial production and approval.